Mixing classic elegance with modern amenities, the Villaggio Europa-Grado provides everything you need for a magical home away from home. Whether you want to chill by the pool or try some hair-raising adventure sports, this beautiful luxury camping site has it all. Book your stay with LUX-Camp, and you could soon be holidaying in Italy. 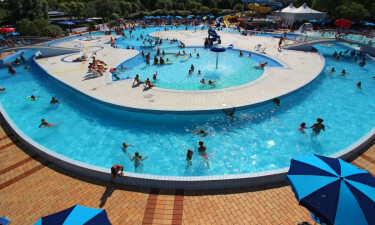 Why should I camp at the Villaggio Europa-Grado? What is really striking about the luxury resort is its incredible location. 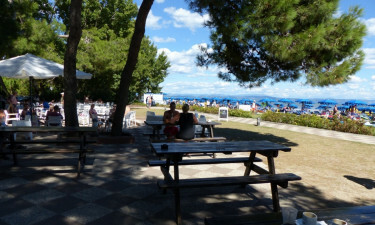 The grounds are surrounded by towering pine trees, and they lead onto a golden sandy beach. When you stay at the Villaggio Europa-Grado, you can get from your mobile home to the shimmering waters of the Adriatic Sea within minutes. The seawater in this area is famous because it contains a high concentration of iodine, which has been shown to help people suffering from sore joints, back and neck pain. The beach is extremely clean and the gentle tides and shallow waters make it a safe place to swim. Sun loungers and parasols are available for hire for a small fee. 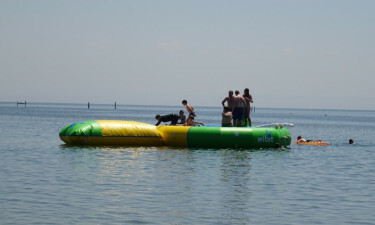 There is also a selection of water sports available at the beach, including banana-boating and jet skiing. There are plenty of activities available to help you work off those extra holiday indulgences. You can participate in football, basketball and tennis matches, try your hand at canoeing and archery, or simply relax and unwind in a yoga class. A bonus is the huge open-air arena, which hosts live musicians, entertainers and theatrical performances to entertain the whole family. There is also a kids club available in the day to keep those little ones entertained so that you have some free time to explore the luxury camping site. A number of local excursions can also be booked at the reception area, which is open 24 hours a day. You don't have to travel far to enjoy some delicious Italian fare as there is a restaurant on site. The classic eatery serves up an array of dishes, including pizzas, salads, soups and freshly caught seafood. You can choose to dine inside or al fresco. 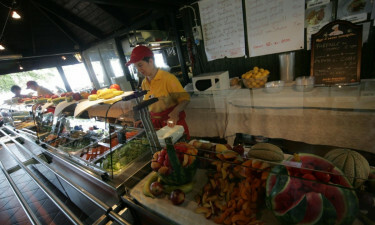 The friendly chefs are able to accommodate a range of diets, including vegan, vegetarian and celiac. There is a supermarket that stocks a range of essentials that you will need to cook up a storm on your camping holiday, as well as snacks, drinks, magazines and toiletries.